Athlumney Manor B&B provides an ideal touring base for so many activities. We welcome families and our family guest accommodation with interconnecting rooms and spacious, comfortable family rooms ensure that after a day’s fun and activity, all the family can relax in comfort at Athlumney Manor B&B. Pat & Pauline have a vast array of information on fun-filled activities available to all their guests. The Zone Extreme Activity Centre– situated in Navan Town, the Zone is a multi-activity and entertainment centre with Indoor-karting, paintball/laser tag, indoor archery, a large games room and a cafe zone. 58,000 sq ft of fun over 2 floors! A real fun-filled family activity. The Diamond Cinema, Navan is a modern 6-screen cinema with all the latest in box office movies. Ideal for a fun day out. Aura Swimming and Leisure Complex, Navan offers state of the art facilities for health and fitness. With a 25m swimming pool, a kiddies pool, 2 water slides, jacuzzi, sauna and steam rooms, fitness suites, astro-turf pitches and playground. Causey Farm, Fordstown, Co Meath – 19 km – provides you with a wide and exciting range of family fun filled activities and events to choose from: traditional Irish dancing, feeding farm animals, cookery lessons, treasure hunts, tractor rides, forest walks, arts & crafts classes, the list and choice are endless. 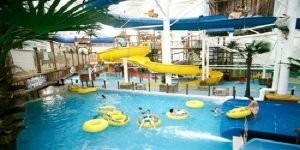 Tayto Theme Park, Ashbourne, Co Meath – 38km – Tayto Theme Park is a modern and well run activity park with an excellent programme of activities for kids and is an unforgettable day out for the whole family. Tayto have turned 55 acres of Meath farmland into an American-themed park which is one of the first themed parks of its kind in Ireland with over 100 attractions. Funtasia, Drogheda & Funtasia Bettystown, Co Meath – 36km – with a range of indoor activities to delight kids and adults alike from their Water park equipped with dare-devil water slides and rope bridges , to skating, bowling, soft-play area, wall climbing, to name but a few. A fast paced fun filled day out for all. Sonairte Ecology Centre, Laytown, Co Meath -35km –Green education for all in organic farming and sustainable living. Sonairte has a coffee shop, nature trails, riverside walks and eco-living demonstrations. Dublin Zoo – 45km – Opened in 1831, Dublin Zoo is one of the world’s oldest and most popular zoos. It has been transformed in recent decades into a 28 hectare park of gardens, lakes and wonderful natural habitats for over 600 animals. This guarantees to be a big hit for all the family!